Give your students Spelling Power . . .
in Only 15 Minutes a Day with this Program! Shown above are the Ready-to-Use Resources that we have bundled together to make your Deluxe Spelling Power Pack. You'll save hours of preparation time because we have done the work for you. Just open the box and begin teaching. You get your Spelling Power manual along with all of the ready-to-go resources in one easy-to-order pack for only $177.90 plus you get free ground shipping, a free Magnetic Notebook Page. And they come packed in your own orange and black Spelling Power Tote Bag! Spelling Power Manual with Quick Start DVD and access to Teacher's Online Resources and Lifetime FREE Help-Line! 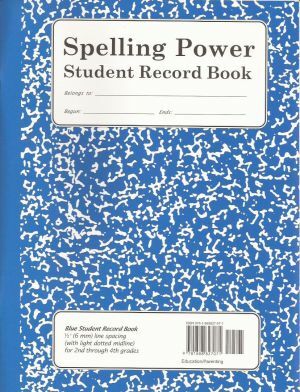 2 Spelling Power Student Record Books in your choice of line size (color). These books eliminate virtually all of your record keeping and are integral to the success use of the Spelling Power program. Learn more about the Record Books. Spelling Power Activity Task Cards Box containing 365 skill-building activities to use during the final five minutes of each spelling session. Spelling Power Word Bank Box with 400 color-coded cards and a set of tabbed organizers to help students drill and review their personal spelling words. Word card activities are used in many of the Spelling Power skill-building activities too! Spelling Power Magnetic Alphabet Tiles with No-spill storage box. This great resource is a fantastic way to illustrate phonetic and spelling rules and the tiles are also used in many of the skill-building activities used in conjunction with Spelling Power. Plus you receive a FREE Spelling Power Magnetic Notebook Page. These pages are three-hole punched for a standard binder and are a handy way to use your Magnetic Alphabet Tiles. When you add Spelling Power to your curriculum, your students will gain confidence in speaking and writing. Everything you need to teach your entire family is found in this one program. Since 1993, Spelling Power's award-winning approach has helped over 250,000 families master spelling skills. And, after 25 years, it is the only complete, comprehensive spelling program written for home educators by a home educator. 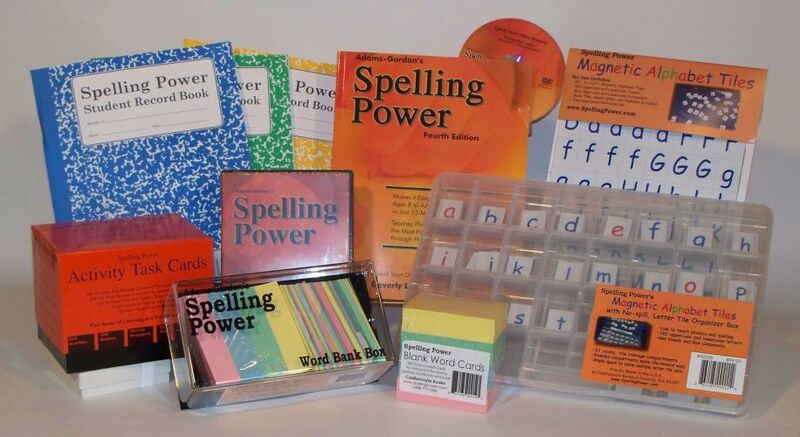 For more information on any part of the Spelling Power Program or to order individual items, click any of the links under Products at the top of this page. Just click the Buy Now button below the Record Books you want with your Deluxe Power Pack. You can add additional Student Record Books to your order by selecting the Student Record Books link at the top of this page. Blue Student Record Book (1/2” lines) for use by students who write using wide-ruled paper with dashed mid-line. Green Student Record Book (3/8” lines) for your students writing best on college ruled paper with dashed mid-line. The Yellow Student Record Book is for students most comfortable writing on college ruled paper with no mid-line. The Deluxe Power Pack with everything described above is only $177.90 with free shipping. Everything else ordered along with your Deluxe Power Pack also receives free shipping. Shipping details: Free ground shipping to U.S. addresses. We can ship your Deluxe Power Pack by Priority Mail to U.S. addresses and foreign addresses and you will receive a shipping credit to offset a portion of your shipping charge. Please call (509-843-5009) for details. You are looking at the Spelling Power Deluxe Power Pack. is available from www.SpellingPower.com or from Castlemoyle Books at 509-843-5009.